AudioBoo is a fantastic, free website and iOS/Android tablet app students and teachers can use to create “narrated art projects” or short segments for class “radio shows.” The free version allows recordings of up to three minutes each, and accounts can have an unlimited number of recordings. 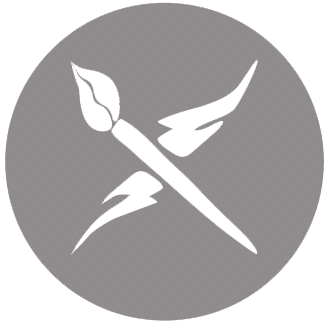 Paid accounts can record up to 30 minutes per AudioBoo. 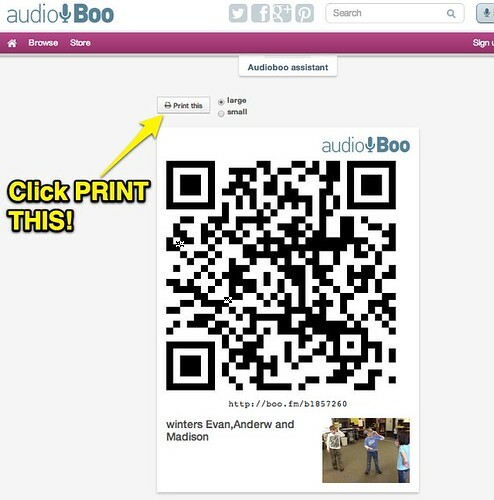 Once your students have created AudioBoo recordings, it can be helpful to print QR codes so parents as well as students can quickly listen to them on a smartphone or tablet. I recommend using the free QR code scanning app i-Nigma, since it’s VERY fast and works on almost every platform. To create a QR code from an AudioBoo recording, you COULD use a separate website, but several months ago the AudioBoo development team integrated QR codes into their site so “they’re just a click away.” Here are the steps you need to follow to obtain and print them. 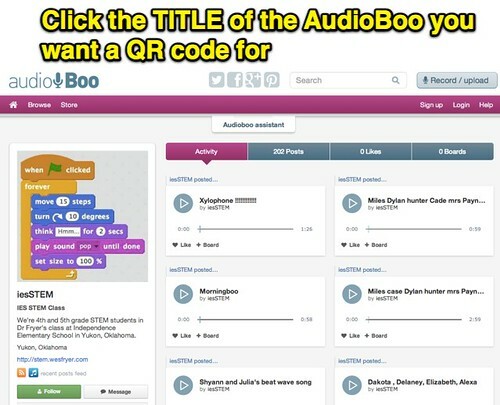 1- Click on the TITLE of the AudioBoo you want to create a QR code for. 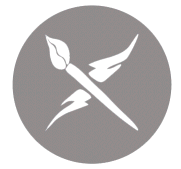 2- At the bottom of the individual AudioBoo page, click the “QR Code” icon. I love how AudioBoo also prints the TITLE of the AudioBoo as well as a “shortened URL” people can type into a web browser (if they don’t have a QR code scanner app or the camera on their mobile device isn’t working) to visit your AudioBoo page. If you’ve ever printed “just” QR codes and later had to scan them to figure out what website they are connected to, you know how valuable it is to have a LABEL pre-printed alongside your AudioBoo. 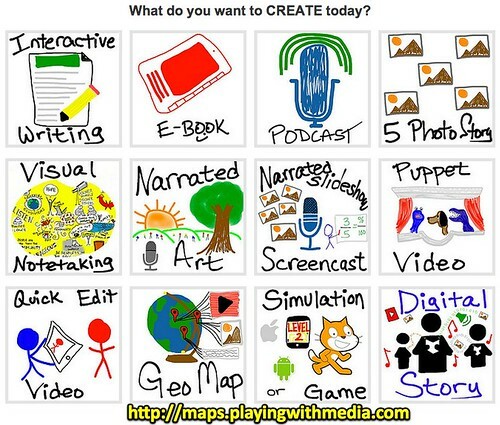 For more ideas, tools, student examples, tips and tricks for creating multimedia projects with students, check out my website, “Mapping Media to the Common Core!” What do YOU want to CREATE today?! 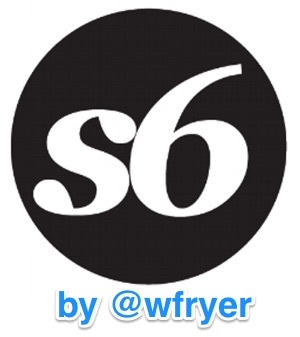 Hi Wes – audio QR Codes are great in classrooms! 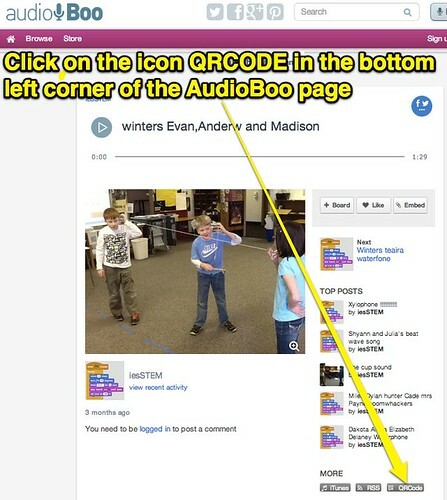 My company Tokkers.com offers audio QR Codes as well, and we’ve seen some great uses in classrooms. We are launching our educational plans very soon, including a free one for teachers. Hi Dr. Freyer, my name is Allison Sells and I am an EDM510 student at the University of South Alabama. I have spent this semester learning about technology and how to integrate it into my future classroom. I am always looking for useful apps for students that will be safe and easy to use. I like that AudioBoo recordings can only be viewed by those who are given the code or url. QR codes are quick and simple to use and the kids love to scan them. I hope to find many more apps that use them in the future.Thanks for sharing this great app.